Sunday Family Faith - Faith...Families...Francis...Fun! Family Catechesis for all ages! Check here each week for a family activity based on the Sunday Gospel reading. Good news! Do not be afraid, but instead open your hearts to all the wonderful gifts and treasures God wants to give you. These treasure are not of this world, but of heaven. Jesus says we have to wait, be watchful and be ready for his return . Not an easy task for children (and us) to understand and live out, unless...we open our hearts to the gift that is available now, the Holy Spirit! If we live in a love relationship with God rather than a fear based one, we will naturally be watchful and ready for his return and our future rewards in heaven. Ask your family to share something that they consider a personal treasure. What does Jesus tell the disciples about God? Why does Jesus tell his followers to be ready? Be Watchful: Make binoculars! Give each person two 5 ounce paper cups, tear out the bottoms. Staple them together, punch holes in the sides and attach a piece of string or yarn. Decorate and use to be watchful and "find" God. 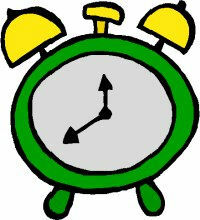 Tick Tock: As a family go through the house and count all the clocks your family has (don't forget the microwave). Talk about important events that you need to be on time for. Recall times you may have been late to something. Have each person choose their favorite clock in the house and put some kind of symbol by it. Remind your family that we need to be aware and alert or we will miss something, like Jesus! Concluding Prayer: O God, you are a gentle Master who gives us all good things. Grant our prayers that we may be vigilant and faithful servants in your kingdom. Grant this through Christ our Lord. Amen. Jesus has come not only to bring peace but also division. What is this? Such difficult words to hear from Jesus, yet it is good to be reminded that the decision to do the right thing is not always easy. This can be a difficult gospel for younger children to understand but it does provide an opportunity to talk about making choices and doing the right thing, even if it goes against the crowd. As parents we can become the "bad guy" and unpopular with our children, but just like God we will not compromise our values and will stick with the plan. Ask your family to share things that might cause division in families. What does Jesus say he must do before his mission is done? Why do you think Jesus brings division? Why will families be divided? Choices: Allocate two corners or areas for this game. Now ask a series of questions such as "would you rather eat pizza or hamburgers, play soccer or watch TV", etc. Have them go to specific corners for their answers. Now make it harder with questions like "Would you give your lunch to someone hungry or just walk by and let someone else deal with it". For older children you can go deeper with real life scenarios. Would you sneak into a movie with a friend or buy a ticket to get in? Finally ask if they are a disciple of Jesus and have everyone move to one area. Discuss that some decisions are harder than others but that we will always have the Holy Spirit to guide us and give us courage.